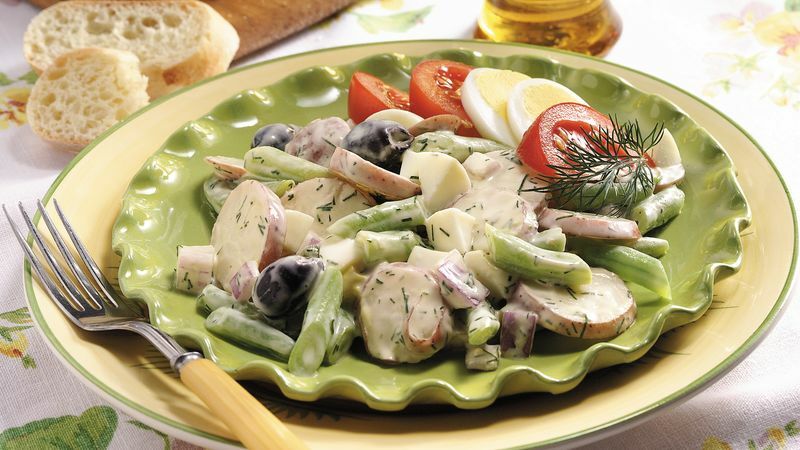 In small bowl, stir together all Dressing ingredients; refrigerate. Place eggs in single layer in small saucepan; add enough cold water to cover eggs by 1 inch. Heat to boiling. Immediately remove from heat; cover and let stand 15 minutes. Drain; rinse with cold water. Place eggs in bowl of ice water; let stand 10 minutes. Peel eggs; coarsely chop 2 of the eggs. Reserve remaining egg for garnish. Meanwhile, in large saucepan, heat 4 cups water to boiling. Add potatoes; return to a boil. Reduce heat to medium; cover and cook 5 minutes. Add beans; cover and cook 6 to 8 minutes longer or until potatoes and beans are crisp-tender. Drain potatoes and beans; rinse with cold water to cool. Drain well. Place in large bowl; add onion, olives and chopped eggs. Add dressing; stir gently to coat. Cover; refrigerate at least 1 hour to blend flavors. Just before serving, slice reserved egg. Arrange egg slices and tomato wedges on salad. Garnish with additional dill.